Muscle therapy with eucalyptus. Deeply exfoliates skin. Helps relax aching muscles. 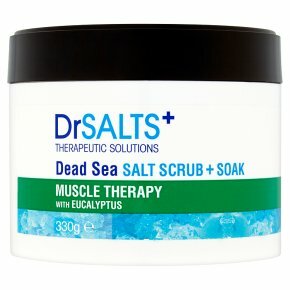 Replenish + detoxifies skin.Dr Salts+ have combined 100% natural Dead Sea Salts with invigorating Eucalyptus and Sweet Almond Oil for a rejuvenating bath time experience that will help to deeply cleanse skin and replenish the entire body. Key ingredients and benefits: + Dead Sea Salts contain 21 different types of minerals including Magnesium, Potassium, Sodium and Calcium, essential for staying healthy. + Sweet Almond Oil rich in Vitamin E help protect and hydrate skin leaving it soft and supple. + Eucalyptus essential oil helps to relieve joint and muscle discomfort, clear the mind and focus concentration. Directions: Use a handful of body scrub and massage into damp skin in circular motions. Soak in a warm bath for 20 minutes. Follow with usual cleansing routine to wash off any excess salt. If irritation occurs, discontinue use. Do not apply to irritated or broken skin. Not recommended for facial use. Avoid contact with eyes. If product enters the eyes rinse well with warm water.